Sunday was May Day or Beltane, the traditional Celtic fire festival that marks the beginning of summer. 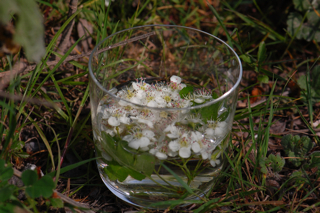 It was a beautiful day which gave me the perfect opportunity to get out and make a Hawthorn blossom remedy. Though it has long been associated with Beltane, it’s been rare in recent years that the Hawthorn has been in flower this early. This is how the Hawthorns looked on the 3rd of May last year. This year they came into bloom in late April and were in the finest of forms by May Day. Their heady scent instantly lets you know when the Hawthorn is in flower. 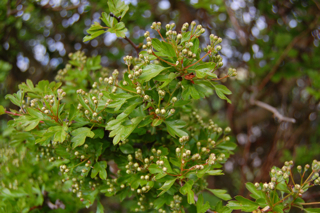 I wrote about the mythology and medicine of Hawthorn blossom last year in this post and now is the perfect time to be gathering the buds, blossoms and leaves to make a fresh tincture. Making a flower remedy on Beltane itself seemed like too good a chance to miss so I dragged myself from bed (it was Sunday) and got set up so my remedy had several hours to steep in the early morning sun. I have full instructions on how to make a flower remedy here if you are new to the process. 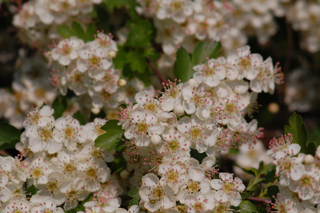 Hawthorn as a flower remedy is equally concerned with the heart as when it is used medicinally as a whole herb, though of course it works on a very subtle level. My personal experience is that it relaxes the whole chest area, allowing us to let go and let the love that is naturally present in us all come to the fore. It helps heal deep emotional wounds and brings the space in which forgiveness can occur. There is also a calm sort of joy about this remedy, as it opens your heart a little half smile creeps upon your lips without you even noticing. Blissful. Use it whenever negative feelings cause you or others to shut down and turn inwards or when the heart needs a little extra support to heal from grief. Or simply use it for no other reason than that it is beautiful. And based on your last paragraph my dear I’m off picking Hawthorn flowers this weekend (if the predicted storms allow it!) I made a Hawthorn Brandy a couple of years ago, I wonder if I could use that brandy as my preservative? I’m about to get Rosemary and Honeysuckle flower essences going ready for the next blog party, I just discovered that I can dry roots in the greenhouse, why I’m impressed I don’t know, guess it just never occurred to me to do that before. So I’ll be putting my flower essence bowls in there to make sure they stay warm and if any showers do occur whilst I’m out and about they won’t get rained on. I have some jolly glass pan lids I got from France that fit some of my glass bowls, I was wondering about putting a lid on the essence? It may mess the process up but I’ve been contemplating the process, in an open bowl some of the precious volatile oils in the delicate flowers could evaporate if it’s a very hot day. My thoughts are if the bowl was lidded any steam/vapour from the petals/water would hit the lid and go back into the bowl when cooled, what do you think flower? About half way down the page is an image of chamomile next to the crystal of water that had been exposed to chamomile. Amazing! Anyway this is what you are trying to achieve with a flower remedy so best to let the sun shine straight on it I reckon. I’m looking forward to reading about your Rosemary and Honeysuckle essences. Have you ever made a Lily of the Valley Essence? I would love to do one but haven’t come across enough flowers growing together yet. Lovely article, Lucinda. The other use of hawthorn essence is to open the heart in preparation for spiritual growth, so I guess being about to deal with forgiveness would be a useful forerunning activity. Debs, I’m not sure I’d be worried about the volatile oils for a flower essence since it’s the energetic signature of the plant you’re capturing, rather than its physical properties. I’ve never put a lid on anything when I’ve been making essences. Hi Sarah, That’s a nice way of looking at it. I think all heart work is spiritual work in some ways. Thanks for stopping by and sharing your wisdom. Thanks for the beautiful post; I’ve never been able to find hawthorns while they’re in bloom, but I’ll have to see if I can find some this year, for sure! I wish you luck in finding some, they are such a delight to work with. We are very lucky they are so common here in the UK. A lovely post with such beautiful photos – I think I am getting some of that hawthorn medicine simply by looking at your pictures, as I am sitting here smiling and it certainly was without my noticing or trying! I do love hawthorn, and its wonderful to see all the many beautiful ways you have interacted with her thus far. I always feel that hawthorn essence gives me the sense of protection and support that allows my heart to open without fear of being hurt. Such a truly amazing tree. I’m actually thinking of framing some Hawthorn photos and hanging them up round my house so I can benefit from their magic everyday. I’m glad they made you smile too. I agree about the protection and support. I always think of trees like Elder and Hawthorn as being very ‘human,’ both in scale and in that they are so useful for us. Whilst they don’t quite have the majestic presence of an Oak or a Beech, they feel so accessible with their healing and messages. I love the pollenated blossoms at the end of your post. 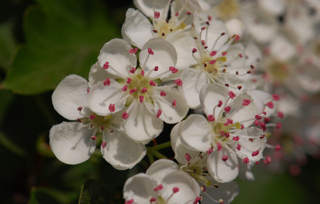 Bless the bees…..
Hawthorn is very precious to me. I am fortunate to have hawthorn hedgerow in the garden….also a very old gnarled tree (which I love). My parents both have heart conditions…..I have been drinking hawthorn tea for a long time. I believe in it’s powers. Thank you once again for a most beautiful post. That’s wonderful Cheryl, do you drink tea of the blossoms and leaves as well as the berries? Old gnarled Hawthorns are the best aren’t they. I love them in the hedgerows but they’re so magical when left to grow as proper trees. Love that red in the white flower – beautiful! A salad tree, how wonderful! I’ll remember that. Here it’s known as bread and cheese, some say because it was so commonly added to bread and cheese sandwiches, others say that it’s because it was as much of a staple food as bread and cheese. I’m not sure which version is correct. 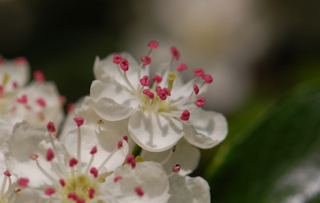 I use the leaves mostly…….also the blossom. I have never used the berries…..I do not know why. I also eat the hawthorn leaves when they are young and tender…….